Texas State may not have been THE snub of the college football world, or the state of Texas for that matter, but they were certainly snubbed out of a bowl game last season. Despite going 7-5, they joined only their Sun Belt brethren Georgia Southern and Appalachian State in not getting a bowl bid despite winning seven or more games. The difference is that since Georgia Southern and Appalachian State are still in their “transition” period between FCS and FBS they were ineligible for a bowl, but Texas State was and deserved the opportunity. Offensively there are plenty of weapons on this team, but the offensive line is the top unit on this team and they should give the skill players plenty of space and time to make plays. Adrian Bellard, a 2014 2nd team All-Sun Belt left tackle, should be the leader of the line and give QB Tyler Jones plenty of time to throw the ball or free up scrambling lanes. It also helps that every other player on this line also has starting or extensive playing experience. Tyler Jones might have the strongest arm in the conference, and that paired with his threat as a runner, should unlock some big play potential for this offense. The Bobcats finished 39th in explosiveness rating last season, and it wouldn’t be unreasonable to expect that to improve even more this year. Robert Lowe is coming off of a 1,000-yard season, so when Jones isn’t carving up defenses himself, he knows he’s got a reliable back to give it too. Also, Chris Nutall returns after a season-long suspension, and after 500 yards and 6 touchdowns in 2013, I doubt he will be an unwelcome sight. There is no standout receiver among this group, but that’s not because there is a lack of talent. It’s because there are several players who can and have made plays. 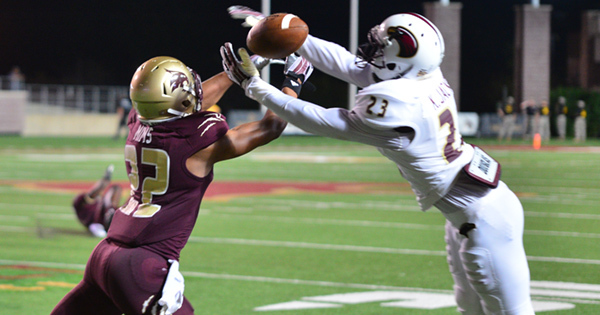 Experience and depth is arguably even more of an advantage in Group of Five conferences, and Texas State has both at receiver. Brandon Smith and C.J. Best may be the best receivers, but expect big contributions from guys like Jafus Gaines, Demun Mercer and TE Ryan Carden too. 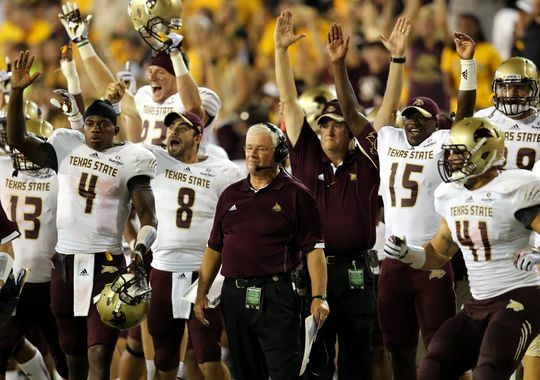 Texas State’s defense was bizarre in 2014. Showing flashes of potential against conference frontrunners like Arkansas State and Georgia Southern, but giving up massive gains to lowly New Mexico State and Georgia State. Consistency will be something the Bobcat defense looks to improve upon in 2015 and it starts up front. This team really struggled against the run last season, and with the loss of some of its biggest playmakers up front that might continue. 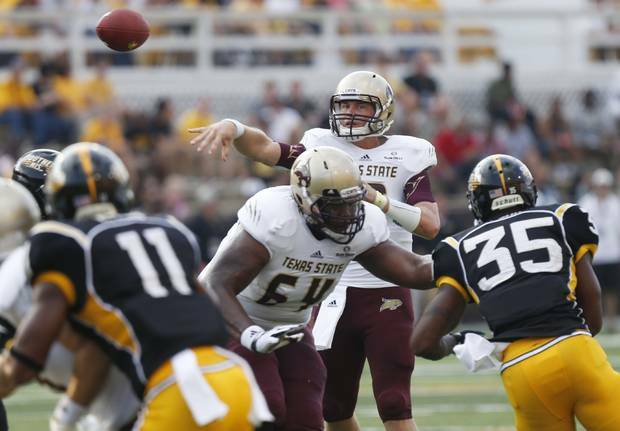 JUCO transfer Roosevelt Pearson could step in and play immediately at defensive end after a strong spring, and it’s probably best for Texas State if he does. It would also be a huge help if nose tackle Dallas McClarty could step up. He managed seven tackles for loss and three sacks, which isn’t bad but the Bobcats could use a little more from him. Cornerback David Mims II is the top playmaker on this defense, and a solid foundation for the pass defense. As the top cover corner in the conference and a contributor in the return game, Mims is also considered one of the top NFL prospects in the conference. He has five safeties behind him with solid experience, and his counterpart at corner, Brandon McDowell, played in ten games last season as a true freshman. So, the pass defense should at least be decent. For the Bobcats’ faithful’s sake, I hope they can hit 7-5 again and get to bowl eligible. As it stands now, 6-6 wouldn’t be good enough (unless they inexplicably lost to Prairie View A&M and won six games somewhere else along the way) because they wouldn’t have the necessary six FBS wins. This teams deserved a bowl bid last year, but with their three biggest conference games (Arkansas State, Georgia Southern and UL-Lafayette) on the road, and an early season trip to Tallahassee to collect a paycheck, I mean, play Florida State that may not be in the cards this year.